Full grandstands, fans lined up along the Nordschleife and a field of nearly 200 cars. The first flowers are blooming in the bright spring sun whilst birds whistle away in the valleys and forests that have formed the track, undisturbed by the echoing of roaring engines. It’s a perfect spring day to start the new VLN season. As the cars are making their way around the volcanic High Eifel for the formation lap, Fred Makowiecki is in charge of the field. It’s the Frenchman who gets to line up his Porsche 991 GT3R on pole position at Döttinger Höhe and set the pace towards the green lights. The Manthey Racing squad took pole position this morning with a notably “slow” lap of 8:01.661 despite perfect conditions. 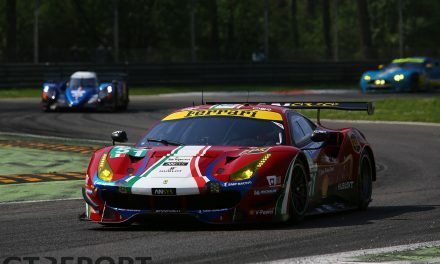 The governing body’s continuing crackdown on speed this year comes in the form of the outlawing of confidential tyres and a reduction of downforce through the adjustment of rear wing position and width, wiping away any time gained by the newly laid patches of tarmac around the track and the ever-ongoing car development. Forcing all teams onto equal rubber has equalized the field and brought the top 15 within five seconds of each other. 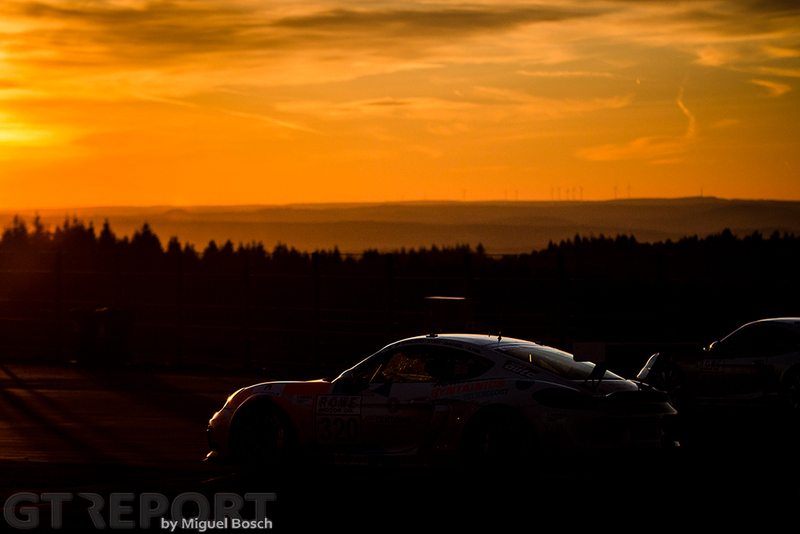 Manthey is sovereign through the first halve of the four-hour long 63. ADAC Westfalenfahrt. 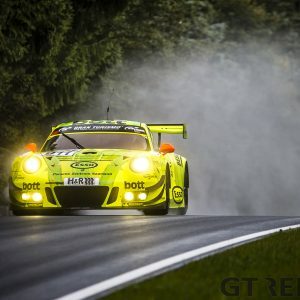 Although never completely gone out of sight, grello”, the name given to the green-yellow Porsche by the men and women from Manthey, is, at least for the moment, untouchable to the competition. 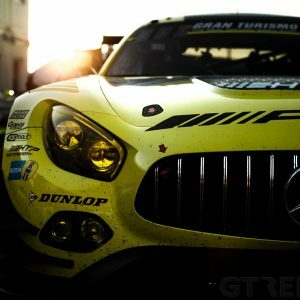 Only pit stops remove Manthey from the lead, but the Meuspather crew always cycles back through to first place at the end of the window. It takes until the third hour for a threat to appear. 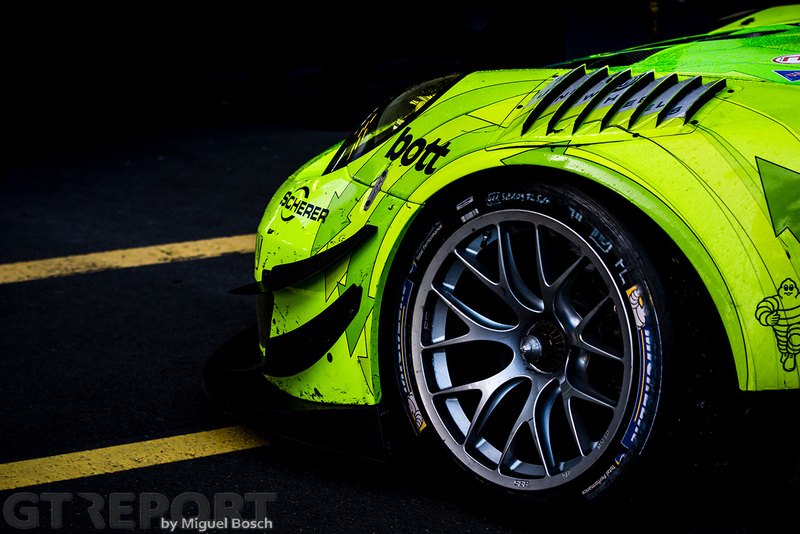 The danger comes from Porsche customer team Falken Motorsports. They’re in the hunt for a place on the podium and looking for more. 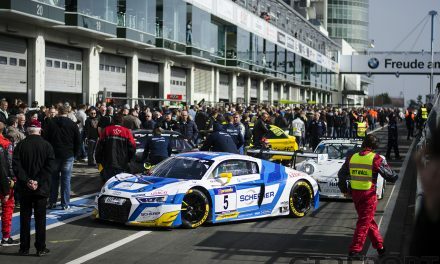 Supported by factory drivers Jörg Bergmeister and Laurens Vanthoor and Porsche expert Martin Ragginger, the Schnabl Engineering-run team begins its push for the top. After concluding the second round of pit stops, Ragginger starts reeling in the Manthey Porsche, now driven by Nordschleife returnee Romain Dumas. One and a half hours remain when the Austrian overtakes the other Porsche for the lead. 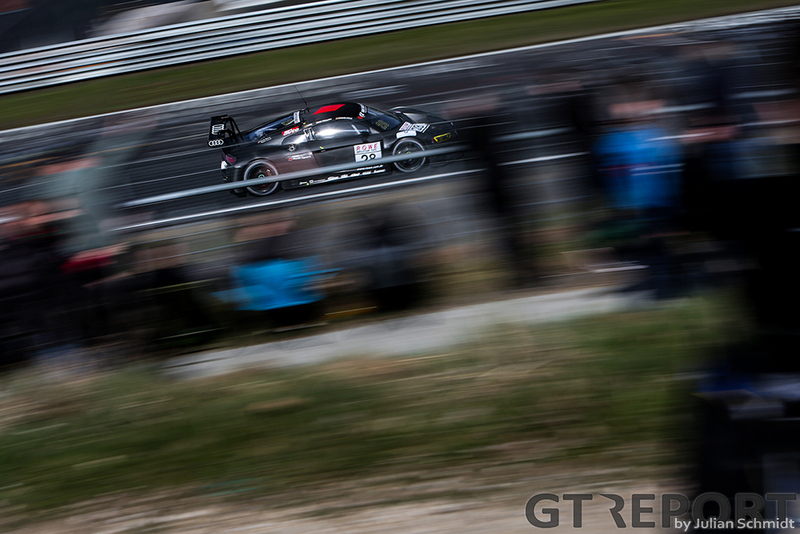 Behind him, Ragginger leaves a trail of following GT3s in his dust. The Falken pilot is a man on a mission. Dumas loses more positions as Markus Winkelhock in the Land Motorsport Audi R8 LMS GT3 and the Bentley Team Abt Continental GT3 relegate him to fourth, but regains it all during the pit stop that sees Patrick Pilet replace Dumas behind the wheel of the Porsche for the final stint. At Falken a drivers change as well: Ragginger makes way for Laurens Vanthoor at the three-hour mark. 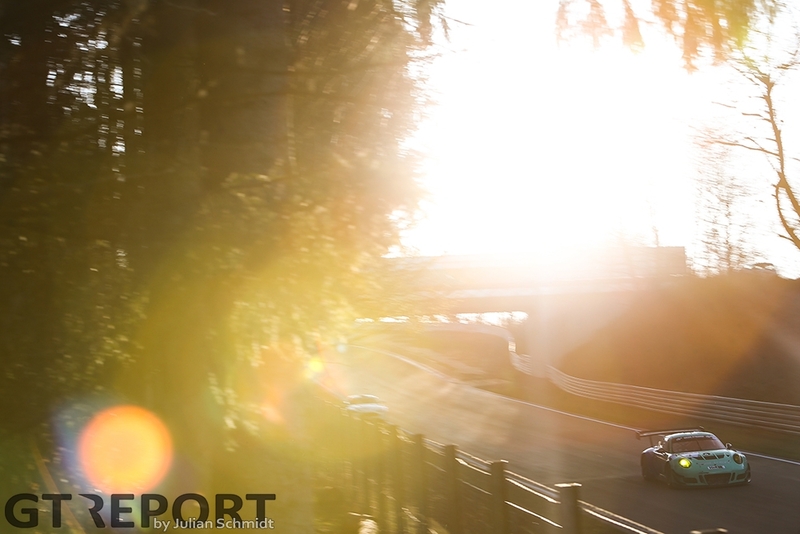 The Belgium pilot seems on pace through most part of the Nordschleife, yet his advantage dwindles. Suddenly, the rushing Pilet is right behind him. With only a few more laps to go Vanthoor must take bigger and bigger risks to keep the neon-coloured Porsche at bay. The clock counts down to ten minutes to go. 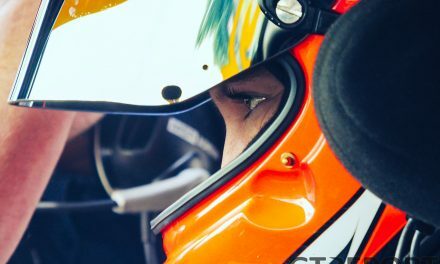 The colours yellow and green in Vanthoor’s rear-view mirrors are more prominent than they’ve been all race. Braking for the Hohenrain-Schikane at the end of Döttinger Höhe, Vanthoor makes the split second decision to shoot past a slower BMW M235i Cup. The move is too late, there’s no space for a big GT3 there. Forced between the guardrail and the BMW, Vanthoor can only evade by going onto the grass and to vainly hope grass doesn’t become guardrail. It does, however, become the harsh steel of guardrail. Vanthoor loses control on the grass and continues to slide to the other side of the track for a smack in the barrier. He knows it’s all over and turns straight into the pits. The damage has been done, there’s no recovering from it. Pilet, whether by his own doing or helped by luck with Code 60 areas as Vanthoor would later imply, has forced the Falken team into a fatal mistake. With his fellow Porsche works driver out of the way, Pilet rides off into the sunset to bring the French trio of drivers victory in the season premiere. Porsche’s distance to the runner up is well over a minute. Bentley Team Abt is having a strong race, even though the Bentley Continental GT3 is no match for the Porsches. 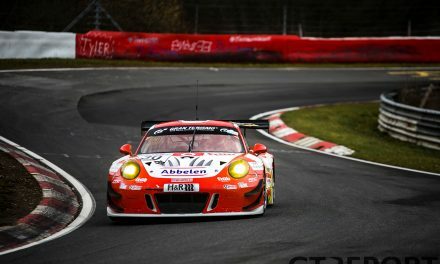 The German-English squad smells blood as many other manufactures are either sandbagging or using the race as a test bed for the 24 Hours of the Nürburgring in May and goes all out in an attempt to record its first-ever Nordschleife podium. Throughout the afternoon, the Leena Gade-spearheaded team follows Manthey’s lead in pit stop sequence and combined with a near-flawless drive of pilots Christer Jöns, Jordan Pepper and Christopher Brück climb up to second place at the waving of the chequered flag, even getting a taste of first place at the start of the final hour. As they continue to collect trophies, Land Motorsport Audi R8 LMS GT3 drivers Christopher Mies, Connor De Phillippi and Markus Winkelhock end the day with another wreath for Wolfgang Land to hang on his workshop’s wall. The newly appointed Audi works team is racing in formation with two other works-supported Audis during the opening hour before shedding its brand compatriots. En route to second place, the Niederdreisbacher team is hit with a stop-and-go penalty after a timing mistake during a pit stop, dropping Land to third on the podium, but not before a late-race scuffle between De Phillippi and the number 50 Audi is decided in the American’s favour. 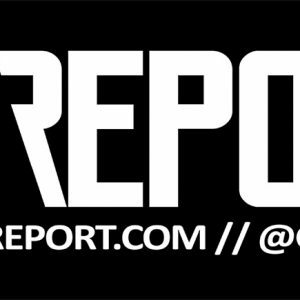 Regardless of everyone’s intentions going into the race, whether they were going for glory, hang back, or prepare for the big one in May, Porsche today showed its true colours as the powerhouse it’s known to be.